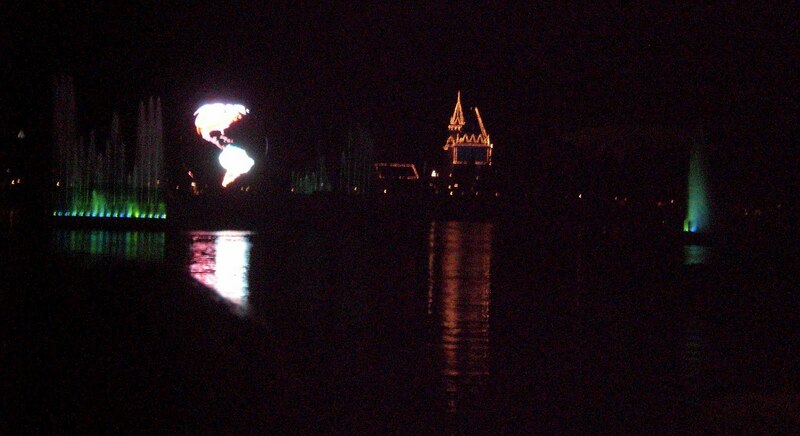 Then it was on to the World Showcase and the start of the Food & Wine Festival. Timing worked out well, since it was around 6pm by then, and we were hungry. 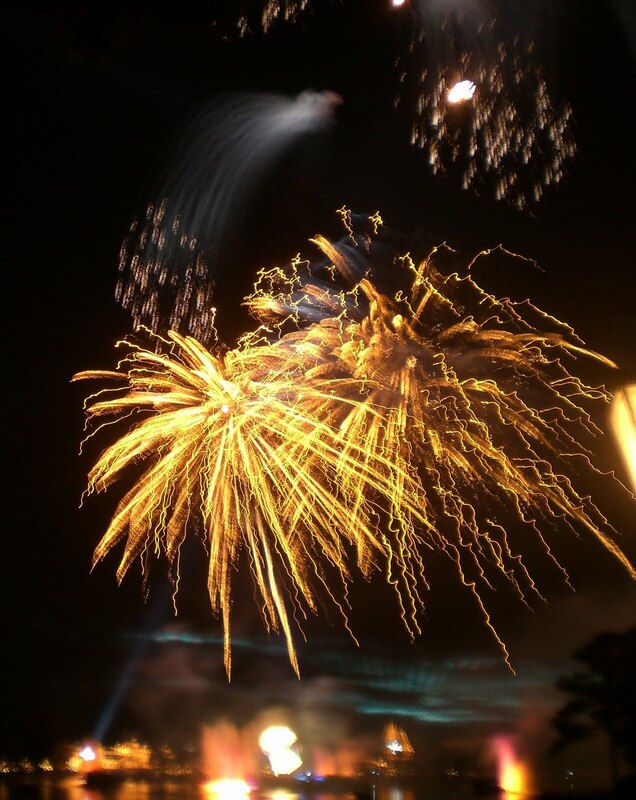 We technically walked the Festival backwards, but we'd actually recommend doing it that way. Our first stop was Charcuterie & Cheese, which isn't specific to any one country, but specializes in wines & cheeses. 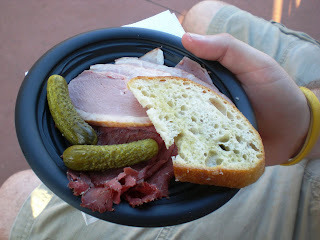 We had the Nueske's Charcuterie Plate, which had smoked beef, duck, and ham with bread. It was all good, but the beef in particular had a nice flavor. 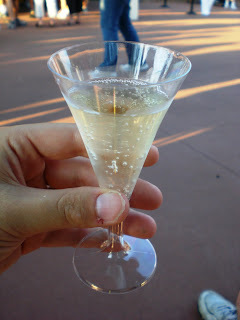 I also had the sample of Prosecco, a peach sparking wine by Martini & Rossi. It was nothing special. Canada was next, where we shared the Canadian Cheddar Cheese Soup (one of our favorites of the night) and tried the Inniskillin Pearl Vidal Icewine. Now, we adore icewine but rarely have it because it's expensive. It was wonderful here, tho a little thick (also not uncommon with icewine). I wanted to stop at Ireland for the Lobster and Scallop Fisherman's Pie, which was absolutely scrumptious. It had carrots and onions in it, and the scallops were plentiful. It was topped with a baked mashed potato, and I'd probably call it my favorite item, tied with the cheese soup. Jonathan liked it, especially because he had a big lump of lobster in his bite! Morocco was a bit of a let-down, as we went with the Tangerine Mimosa Royale, which wasn't anything special. Tasted like you'd expect, and was a bit pricey for the serving size. I think Jonathan's favorite was probably Australia. He had a grilled lamb chop with roasted potato salad and red wine reduction. I tried it, but of course I don't really like lamb. I thought the potatoes had a nice flavor, despite the red wine drizzle. I had considered getting the Lamington from that station as well, but it turned out that the chocolate-covered butter cake was also covered in coconut, so I skipped it. Then it was on to Germany! We were really looking forward to that one, and honestly would've ordered everything on the menu (except the two beers) if we weren't pacing ourselves! They had 4 Rieslings to try, and since Jonathan enjoys Riesling, he was hard-pressed to choose one. 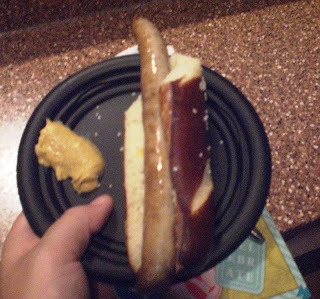 He went with the Gunderloch Diva Spätlese, which ended up being rather sweet, and even I enjoyed it. We also had a Nürnberger Sausage in a pretzel roll, which came with a wonderful mustard and was delicious (and probably the largest portion for the price that we had anywhere). Again, I had planned on trying the Apfel Strudel with Werther's Oiriginal Karamell Sauce, but was told it was covered in nuts, so I refrained. 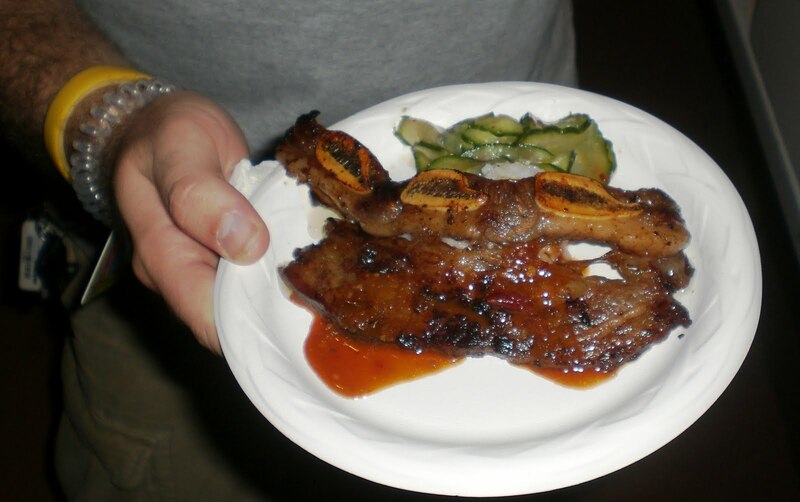 Our next stop was South Korea, where we couldn't resist the Barbecue Short Ribs with steamed rice and cucumber kimchi. The ribs had an excellent flavor, and I thoroughly missed the Korean sauces, since it's been so long since I've had that. I was getting pretty full, otherwise I would've dived right into finishing off the rice (which was sticky like sushi rice) and the cucumber (which was plentiful). We actually paused after that to take a restroom break and to ride the Maelstrom, which is Norway's ride (and my favorite in the World Showcase). Again, no line. The ride wasn't as great as I remember, and they've also added a 5-minute film on Norway at the end of it, but we didn't stay. There's also a possibility that the film isn't new, but neither of us remember ever seeing it before. After some deliberation, Jonathan tried the Grilled Pork Skewer with Farofa at the Brazil kiosk, which he enjoyed. Farofa is really ground up spices covering the pork, making it incredibly dry in your mouth, LoL. I thought it was kinda bland, especially since it was supposed to be a "rooty" flavor. 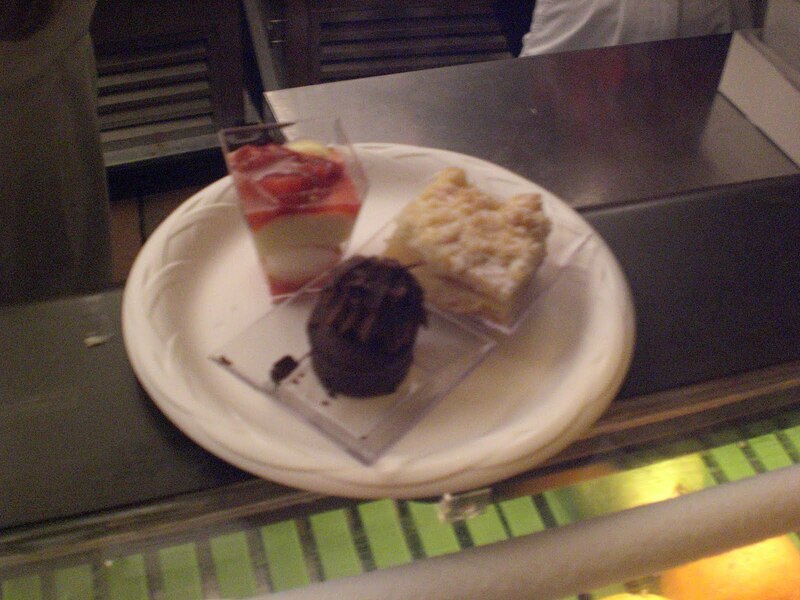 I was really excited about the Desserts & Champagne booth, and had planned to order two out of the three items. At this point, Jonathan was feeling like something chocolate, so he was probably going to order the third item. I was getting concerned about running out of money (we had picked up a Disney gift card earlier to make transactions faster), but it turned out that at that station only you could get all 3 items for just $3.50! That settled that! I dove into the Strawberry Angel Verrine, although Jonathan did try the middle part of that layered dessert, and found it to be very good. 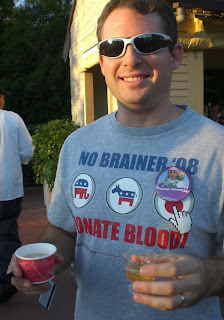 I enjoyed the Pear Streusel Pudding cake much more than he did, too. He did eat the bulk of the Dark Chocolate Sensation (kinda like a brownie bite with chocolate mousse on top) tho, which was fine with me. On our way to find a nice place to watch the fireworks, we stopped at the Puerto Rico location and got a Bacardi Frozen Torched Cherry Colada. It was very creamy, and probably the least coconut-ty colada I've ever had. It was a nice way to finish. I had never seen IllumiNations: Reflections of Earth before, since I've always left Epcot before closing time the other 4-5 times I'd been there. 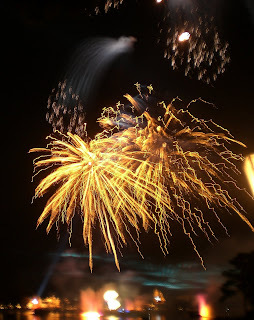 Jonathan remembered it quite well, and had a nice spot picked out where we could see just about everything (it's fireworks plus an on-the-water display plus various buildings on the water light up as well). 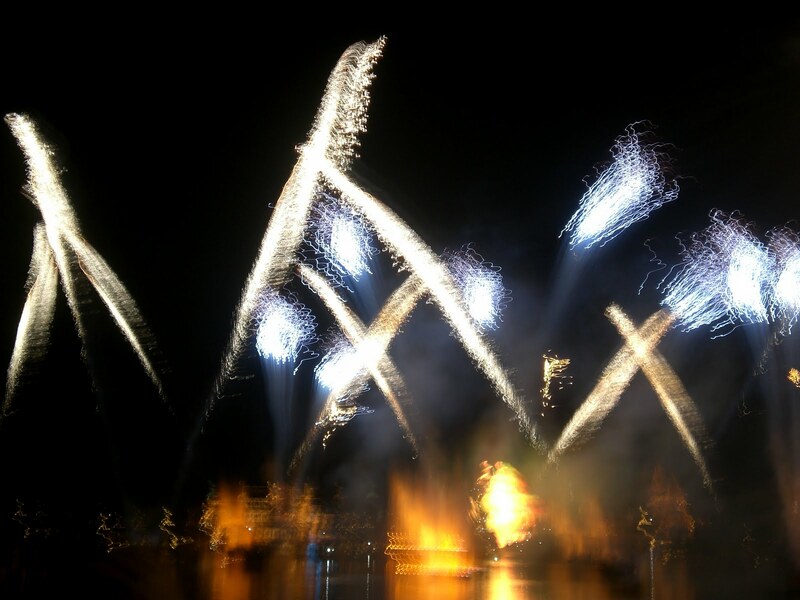 I wasn't all that impressed, but I suppose it's good to know what else is out there (I've always been at Magic Kingdom at the end of the day when I've park-hopped, so I see their beautiful display above the castle). I tried to take a bunch of photos, but most didn't turn out so well.